CLAYTON – Daphne Benzaquen always aspired to be her own boss, she just didn’t know at what that would look like. Benzaquen started out as pre-med in college but quickly realized that was not for her. She decided to take some business courses and ended up returning to St. Louis to get her MBA at Washington University. It was in her second year that Daphne began looking for a backpack to carry around her laptop and books. That’s when and daph. began to form. Benzaquen thought of Peru, the place that she was born. 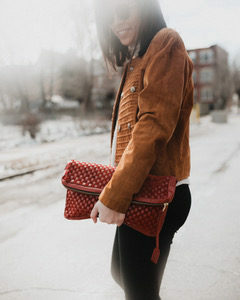 Knowing that the city of Arequipa has always been known for its leathers, especially for belts and jackets, she thought maybe she could design the backpack she wanted. Benzaquen then set up meetings with the manufacturers for three months out. She, along with her aunt and sister, visited Arequipa to meet with the manufacturers and see the designs they made based on the email conversations. The final manufacturer that Benzaquen met with had the closest design to the product she had pictured. Benzaquen noted that they had told her with the short time given, it had been difficult to make but they figured it out. She said it had been difficult to communicate via email, with no relationship established, but alas she had her backpack with the quality and uniqueness she desired. 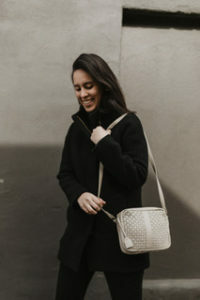 Benzaquen designed a backpack, a bucket bag, and a belt bag. After a year of back and forth with the manufacturers, the first collection of daph. was completed. “I kind of learned everything along the way,” Benzaquen shared. Benzaquen began her process by drawing her products, cutting pieces of paper to the precise measurements, and making a paper bag. With the help of her aunt, who is an architect, she was able to draw out bags from different perspectives. Then, she would begin the color and weaving process for each bag with a clay model, which gave her a 3D perspective to see how the weaving on the purses looked. Choosing the color for each bag is the part that makes Benzaquen the most nervous. Unable to predict the future, she said she can never know which colors will be in style. The design and manufacturing process takes about a year, so she picks her colors a year before she launches the collection. She said one of the most important things she has learned so far is patience. From only telling her immediate family about the first launch of daph., to a little over a year now, Benzaquen said she has continued to get a lot of support from her friends and family. She still works with the father-daughter manufacturer in Peru. 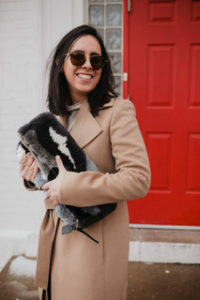 They walk her through the process of making sure all of the products used are environmentally friendly, especially with the baby alpaca fur which comes from the first shave of the alpacas ensuring that they don’t overheat. Benzaquen goes to Arequipa twice a year – once in May and then again in August – to meet with them and go over the product together, in person. “They make sure I understand how they’re doing it, the product quality level, what materials they’re using, and why it takes an extra two weeks to get completed,” she said. It’s important to Benzaquen to give back to Peru through daph. In August 2018, with the Peruvian American Medical Society (PAMS), daph. provided a Prite NiÑO JesÚS, a special needs school in the middle of the Amazon jungle, with a multi-sensory wing. Benzaquen’s dad was the president of PAMS last year and chose to have their yearly conference in Tarapoto, which is in the Amazon jungle, where he is originally from. Benzaquen was the president of the Auxiliary Fund, which deals with both the social and giving back aspect of PAMS. Benzaquen wanted to make sure the organization that PAMS and daph. gave back to was located in the same city as the conference. The children who attend Prite NiÑO JesÚS, are autistic, blind, or deaf. The multi-sensory wing helps to introduce the children to rough and smooth surfaces, cold, hot, light, and dark conditions. Benzaquen said that even after building the multi-sensory wing, there was funding left over. She donated the rest to Prite NiÑO JesÚS. The school was able to also build a therapy pool for students. daph. is now contributing to an organization that helps children with neural diseases located in Lima. Benzaquen said that with Peru’s high poverty rate, the children there are the most in need of giving back. Benzaquen said she wants all of her future organizations that daph. gives back to be similar to her first experience. She doesn’t want to just write a check. She wants to be able to visit and volunteer and give back her time in addition to the money raised. As of right now, Benzaquen is in charge of doing everything for her business. She does work with a local photographer, Maddie Stringfellow, but she does all of the social media posts and planning on top of designing. Benzaquen said she can handle doing all of it, for now. Eventually, she would like to delegate someone to assist her, she said she is still working on the process of how to do that. Benzaquen shared that when she hires someone, they will be her right-hand person and she wants to make sure she has established a set of guidelines to help ease the process, but also make sure her hire feels like they have an impact on the brand as well. Hoping to expand more in the Midwest, Benzaquen said she is looking to do more pop-ups or boutiques. She said that even though she is Peruvian, she’s also a proud St. Louisan – she loves St. Louis and the Midwest. She also wants to continue growing her brand here in St. Louis and keep her customers. She said she is working on nurturing the relationships that she has already established with her customers because she believes it is what is helping her brand and product grow. In a couple of years, she would also like to eventually have an office with a showroom for her bags. She has noticed that many brands are moving from the brick and mortar to a showroom space and she really loves the concept. Favorite place to eat in STL: Copper Pig, Cate Zone Chinese Cafe, and Mission Taco. What shows are you currently watching: Riverdale, How to Get Away with Murder, and Grey’s Anatomy. I love Fallon, the main character in Dynasty because she’s such a girl boss. The Fyre Festival Documentaries, I highly recommend both of those. Have you read anything lately: I’m reading “Girl CEO,” my sister got me this. It’s a small little book, but whenever I have time I read one of the stories from one of the CEO’s. And then “How to Never Lose a Customer.” That was really good on customer relations. Are you seeing any trends in the entrepreneurial realm: Everyone’s growing. I’m noticing that more people are putting themselves out there because that’s really the hardest step – taking that plunge. I’m also noticing the collaboration happening in St. Louis, which is amazing and makes me even more proud that I started daph. here. What is the best advice you would give: Fail fast, fail forward. Try something, because if you don’t try it, you won’t know. And along those lines, just ask. Whether it is asking for a raise, ask for help, ask to meet someone. That’s how I met my mentor, Allison Mitchell. Just asking to meet people, and the worst thing that could happen is they say “No.” Dealing with rejection is really important as an entrepreneur. Who or what inspires you: I love Sara Blakely. I guess the reason I like her is her realness. I’m inspired by people who are themselves and that’s what I’m trying to instill in my own brand. Being okay with who you are, but also being really aware of [weaknesses] – willing to admit it and willing to work on it. I think that’s a really admirable quality to have. What do you do in your free time: Cooking, pilates and yoga, going to events with friends, whether it’s food festivals or events that give back to the community. I love the experience and trying new things and introducing new places to friends. I spend Sundays with my family, every Sunday I go for a home-cooked Peruvian meal. To shop daph. products, go here.